Brief History Published by George Bell and Sons in 1896, with the caption 'Sympathy', in 'THE CAT, Her Place in Society and Treatment' by Edith Carrington. Original drawings or paintings of cats by Harrison Weir are extremely rare, and due to his recognition as the 'Father of the Cat Fancy', are often considered more significant than those of other subjects. In truth, he was also famous as a poultryman and a consummate expert in that field, so some of his early poultry paintings are highly prized and of more than equal value. 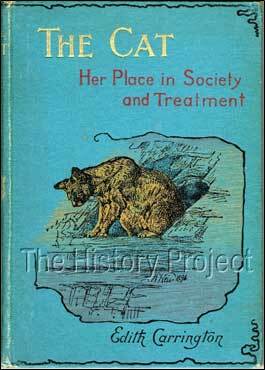 In 1896, he was teamed up with the writer Edith Carrington, to produce a wonderful but little-known work entitled THE CAT, Her Place in Society and Treatment. "As an Artist, not even Landseer himself, has done more to plead with all hearts, especially those of children, on behalf of the Speechless. He, "opened his mouth for the dumb," though he believed in the silent art, rather than in the eloquence of the tongue. "The Eye-gate is easier than ear-gate," he would say, "and where people are slow to grasp what is written, they are quick to read it in the form of a picture." "A good picture," wrote Weir, "often softened sorrow. Art can teach as well as Literature." A little over ten years earlier, she and Weir had collaborated on a small series of Children's books about Animals, written by Carrington and illustrated by the aging artist, who was already by that time past his 70th year. Although not a part of that specific series, THE CAT, Her Place in Society and Treatment was published by George Bell and Sons, containing many new drawings and anecdotes about cats. The original drawings were rendered in Pen and Ink, using either blue, black or sepia coloured inks, and almost all were signed and dated. What is not generally known about Weir, is that he suffered significant personal losses during his lifetime. He somewhat tragically outlived two of his three wives, and three of his four children. His first wife was Ann Herring, the eldest daughter of the famous horse painter John Frederick Herring Snr. With Ann, he had four children, two sons and two daughters. They were married for 29 years, Ann dying after a relatively short illness in 1874. 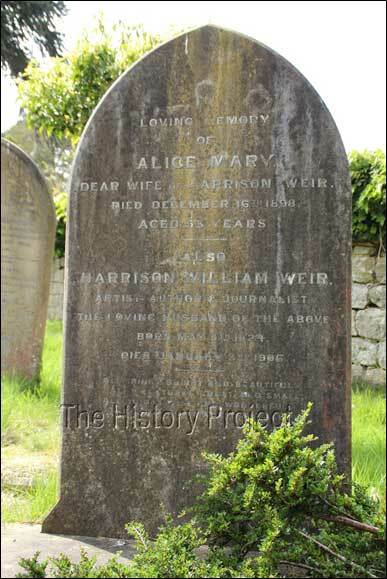 He was married a second time, to Alice Mary Upjohn, in 1875 and this marriage lasted another 23 years, until Alice also died in 1898, when Harrison was 74 years old. Even though all his children lived well into adulthood, it is estimated that his eldest daughter Edith, died on an as-yet unspecified date between 1885 and 1891, after a long and protracted illness, leaving a husband and no issue. His eldest son, Arthur Herring Weir; who was a Civil Engineer working at the time in La Paz, Bolivia, died suddenly in 1902, leaving a wife and two children. Then his unmarried youngest daughter, Grace Harrison Weir, died after what appears to have been a short illness in 1903. Weir himself, is known to have himself suffered long and repeated bouts of various illnesses, dying in January 1906, in his 82nd year. He was survived by his third wife Eva, and only remaining youngest son, John Gilbert Weir, who was married with two children and who lived well into his mid-nineties, dying a couple of years after the end of the Second World War. In this instance, an image was produced of a woman convalescent, in bed, cossetting an appreciative domestic cat with her hand, after the cat had jumped up onto the bed. 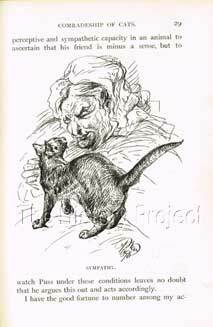 It is highly unlikely that Weir would have looked outside of his own home for a suitable model, as his second wife, Alice Mary Upjohn;(to whom he had dedicated his epic book Our Cats, in 1889) was already often convalescent at home when this drawing was executed in 1896. She suffered from frequent and worsening episodes of bronchitis, and possibly bronchial asthma, passing away from complications associated with her illnesses, only a little over two years later, in December of 1898. Scan from the original Pen and Sepia Ink drawing, in The Harrison Weir Collection. It seems probable that Alice was the love of his life, strongly evidenced by the fact that after his own death in 1906, his will specified that he chose to be buried with her, in the churchyard of St. Nicholas Church, Sevenoaks; the village in which they had spent the greatest portion of their married life together. His third wife, and sole surviving son it would appear, did not voice any objection to his stated desire. to a gentle, true, fondly loving, good and devoted wife. And all His wondrous works". 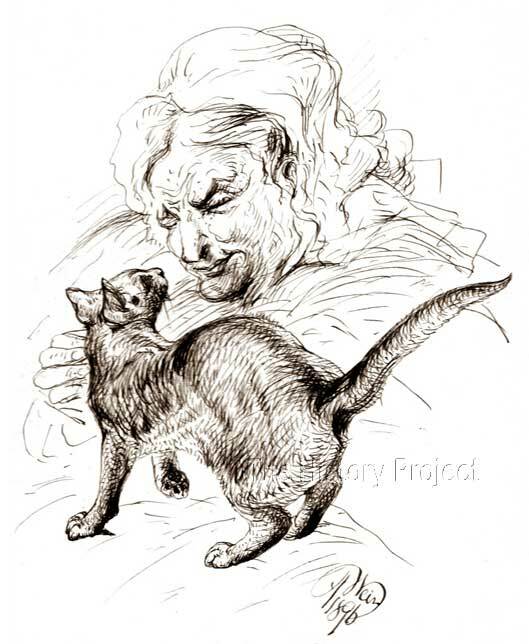 The drawing of the cat with Alice, in this case; is, when married to the facts surrounding his home-life and Alice's convalescence; a very poignant reminder that not all the circumstances are obvious when we view a record of what is essentially a glimpse into a very private moment in Weir's personal life. We can clearly see in both the drawing and his written tributes to his beloved Alice, the true, deep and heartfelt emotions. of a man moved by their joint passion for a love of all animals. Photo: Jeannine Parfitt, April 2017. In the Cemetery of St. Nicholas Churchyard, Sevenoaks. The Cat: Her Place in Society and Treatment (1896) by Edith Carrington. Our Animal Brothers March 1906, Edited by Edith Carrington. The Sevenoaks Chronicle, December 23rd, 1898. (Quote from the Wreath). 'Original Pen and Sepia Ink Drawing' (1896), courtesy The Harrison Weir Collection. Photo of Gravestone, (April, 2017) by Jeannine Parfitt, courtesy of St. Nicholas Church, Sevenoaks.